Traces of an Old Vineyard, best album 2015. Traces of an Old Vineyard is all about a poignant intimacy in that connection between poetry, voice and music and the result is stunning. ...there is nothing extraneous or distracting when it comes to Mahsa Vahdat delivering the tale. Everything fits. Musikken på Traces of an Old Vinejardkjærtegner og utfordrer oss med sin langsomhet, rytmiske variasjoner og enkelhet. Mahsa Vahdat has masterfully proven how it’s possible for Persian music to continue evolving. It is amazing to hear how three instrumentalists and a voice conjure such a variety of spheres. The ease with which here variety of styles are bridged, lifts the music to the category of fully convincing fusion. 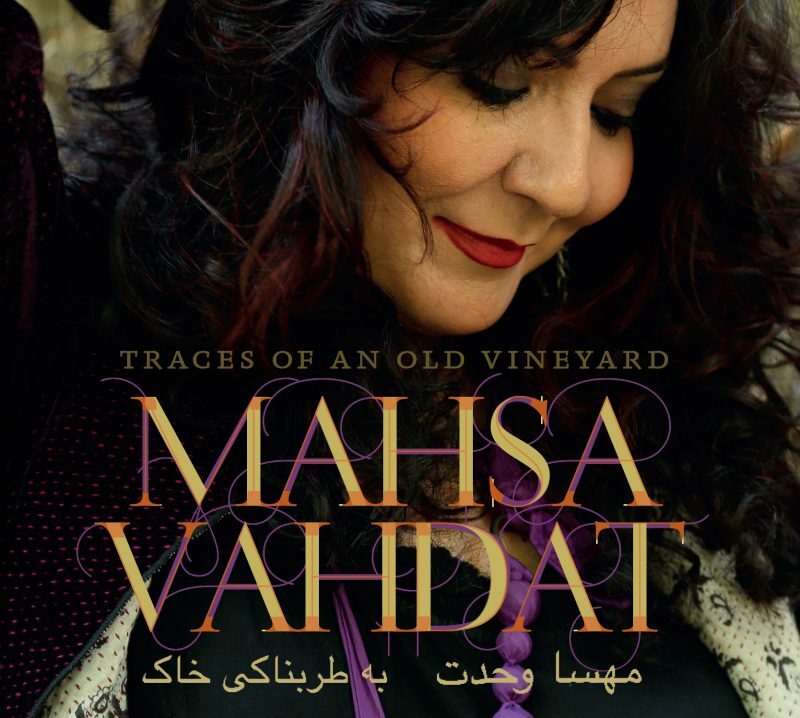 The Magazine ”Songlines” proclaims Mahsa Vahdat’s album ”Traces of an Old Vineyard” as one of the 10 best albums of the year 2015. The record was released by Kirkelig Kulturverksted (KKV) in January. ”Songlines” is a leading, British publication within the genre ”world music”. The news will be fully presented in the December edition of the magazine. The album contains Mahsa’s own melodies to poems by the classical Persian poets Khayyam, Hafez and Rumi. Tord Gustavsen is her arranger and pianist, and the other musicians accompanying her are Shervin Mohajer (kamancheh) and Ali Rahimi (percussion). The poems on the record express a big variety of the many aspects of life and love: Devotion, desire, ecstasy, tensions, disappointments, sorrows. The musical idea of the album is to develop the beauty in Persian poetry and the vocal tradition within the framework of a playful meeting between Iranian contemporary instrumental music and a jazz pianist. The recording was done in Jakob Culture Church in Oslo in September 2014 by the sound engineer Martin Abrahamsen and the producer Erik Hillestad. The album was released internationally from the end of January 2015. Mahsa Vahdat is a singer who develops the rich Persian vocal tradition. She brings about both Persian, classical poetry (Hafez, Rumi, Saadi, Khayyam) and the contemporary one. She has a long career as recording artist on the Norwegian label KKV including collaborations with Knut Reiersrud, the mixed choir SKRUK, Mighty Sam McClain and most of all with her sister Marjan Vahdat. ”Traces of an Old Vineyard” is the first record in which she appears under her own name only. Together with Marjan Vahdat and other collaborators, Mahsa has done an international career with concerts in many countries in Europe, Asia and America. She will participate in many festivals in Europe, Australia and New Zealand during the coming spring. At the time she works with a new album with no instruments (a cappella). In 2010 Mahsa received the “Freemuse Award”, and in 2012 the Vahdat sisters were given the ”Independent Music Award” for the record ”Twinklings of Hope”. Last summer the web magazine ”Iranwire” presented Mahsa on a list of the 50 most influential Iranian women through the last 200 years. 2004 – ”Lullabies from the Axis of Evil” – with a number of singers. As a tribute to a defiant and rich heritage and to a world of beauty and unknown depth, the celebrated Iranian singer Mahsa Vahdat releases her first solo album. After six albums with different kinds of collaboration (with her sister Marjan, with the American soul singer Mighty Sam McClain and with the Norwegian choir SKRUK), she now for the first time carries a project under her own name. The album is called “Traces of an Old Vineyard”. It contains her own melodies to poems by the classical Iranian poets Khayyam, Hafez and Rumi. The musicians who are accompanying her are Tord Gustavsen on piano and keyboards, Shervin Mohajer on the Persian string instrument kamancheh and Ali Rahimi on percussion. The poems on the album express a great variation on the many aspects of love and life: devotion, desires, ecstasy, tensions, disappointments and sorrows. The musical idea of the record is to develop the beauty of Persian poetry and vocal tradition within the frame of a meeting between Iranian contemporary instrumental music and a jazz pianist. All the songs are arranged by Tord Gustavsen with whom Mahsa has worked several times before. The recording was done in Kulturkirken Jakob, Oslo in September 2014 by the sound engineer Martin Abrahamsen and the producer Erik Hillestad. The album will be released internationally from the end of January 2015. Through the year several concerts will happen, it started with a release concert in Kulturkirken Jakob on the 24th of January. Another highlight will happen on the 9th of July when Mahsa, Tord Gustavsen and other musicians will present the repertoire during the Istanbul International Jazz Festival. The album is supported by the Norwegian Ministry of Foreign Affairs and Fond for Utøvende Kunstnere. Mahsa Vahdat has been granted the Freemuse Award (2010). Her previous projects have been given great reviews in many countries. “Twinklings of hope” (2012) was regarded as a “Top of the World Album” by the Songlines Magazine, and won the “Independent Music Award” in 2013. Songlines Magazine talks to sisters Mahsa and Marjan Vahdat about living in Iran and coping with the country’s music censorship. Read the full interview here: The Sound of Silence. Traces of an Old Vineyard – album of the month at World on 3 (BBC 3 radio).